As early as Monday Haverford’s Special Collection will have a new book: Claudius Ptolemy, Centum Ptolemaei sententiae ad Syrum fratrem à Pontano è graeco in latinum tralatae, atque expositae. 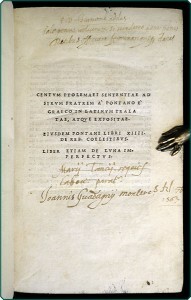 Eiusdem Pontani libri XIIII (Aldine, 1519). For a number of reasons I am excited about this book. Perhaps obviously, my own research interests make this an important book—Ptolemy’s Centiloquium was one of the most widely used texts for teaching and practicing astrology in the early sixteenth century. More broadly this book indicates Haverford’s and the library’s commitment to Special Collections and acquiring new material to facilitate and extend faculty research. In our modern, iPad-Kindle-Nook, deliver-to-desktop, on-line centric world, we can easily loose sight of the wide range of materials that enable scholars to do their research. For me and scholars like me our research would be impossible without collections of books. In this way, to quote a colleague, the library is like the “laboratory for the humanities” and this book is an instrument in our research.